Juicer pulp is used to make this delicious, moist, spiced carrot pecan bread. It is a great way to avoid wasting nutritious leftover pulp from juicing. Disclosure: This post is in collaboration with Stonyfield and Barlean’s. Thank you for supporting brands that allow me to bring you creative content! I’ll start this blog post with the sad truth: we’ve become a society of very wasteful human beings. Food is wasted, services and time are wasted, waste is everywhere! Thankfully, awareness has been brought to this subject and chefs and restaurants are working their hardest in reducing their waste. At home, I’m also trying to do the same and watch what goes into the trash, if anything. And as I’m juicing carrots for fresh carrot juice in the morning, I realize the amount of nutritious juicer pulp I’m about to dump into the trash and a light bulb turns on. Why not turn this juicer pulp into a healthy, nutrient packed carrot bread?! 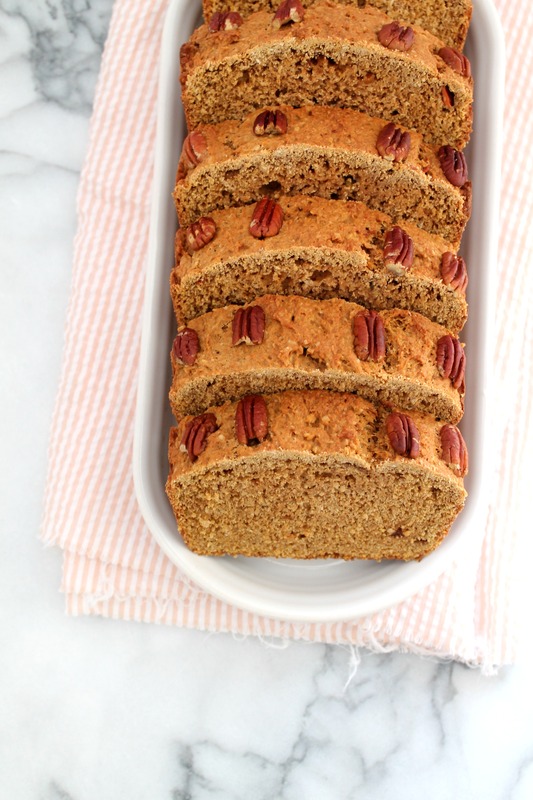 Spiced Carrot Pecan Bread is born on this idea – to stop wasting and start creating! The carrot pulp is then added to the batter of this bread, spiced with cinnamon, ginger, and cardamom – my top three favorite spices, not only used for their glorious flavor and aroma, but for their health benefits. 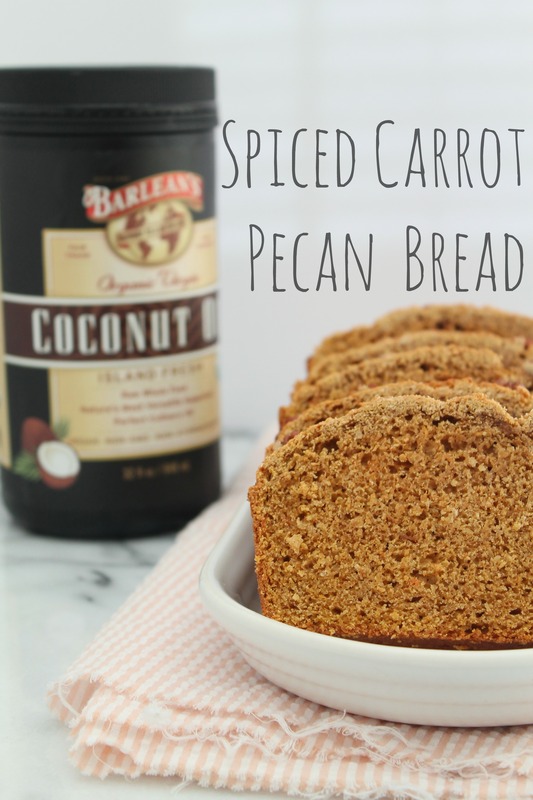 Another healthy addition to this bread is the Barlean’s Organic Virgin Coconut Oil, which is: hand selected, harvested at peak flavor, non-hydrogenated, rich in lauric acid, USDA organic, vegan, gluten free, and non-GMO, as well as fair trade and cold pressed. Basically, a coconut oil worth swooning over for! Paired with my favorite Stonyfield yogurt, this recipe is the perfect way to treat yourself while still trying to stay healthy and using up juicer pulp that would normally go into the trash can. Next time you are about to throw food waste away, take an extra minute and think about how you could repurpose it. It’s worth the minute to prevent food from being tossed in the trash. Preheat your oven to 350F and grease a loaf pan. Set aside. In a separate bowl, whisk the sugar, coconut oil, carrots, buttermilk, yogurt, and egg. Pour the liquid mixture into the dry ingredients and mix. You'll have a very dry mixture but that's okay. Scoop batter into loaf pan and smooth top. Sprinkle pecans on top and bake for about 40 minutes, until cooked all the way. What kind of delicious things would you make with juicer pulp?